The coveted Waterford Crystal Bowl made its way back to Belfast as the Trojans overcame a tough and spirited Trinity College side, as the defending champions grinded out a 7-0 win in front of 1,500 fans in Tallaght Stadium, Dublin this Sunday. The Trojans were aiming to clinch their third consecutive title whilst the undefeated students were entering their first appearance in the Bowl game, hoping to claim victory in their debutant year. However, amidst the lightning strikes and the torrential rain, a pick-6 from Connor Whitla was all that separated the sides as the Green Machine headed back up North as champions once again. The game as a whole proved to be a defensive battle throughout with both offences struggling to produce any concrete chances, as possession swung back and forth in the opening stages. Each team started very cagey with the nerves of the occasion perhaps getting the better, as the wet conditions created fumbles and turnovers that would halt any forward momentum. Trinity’s Offence, consisting of the talented duo of Quarterback, Dan Finnamore and Running-Back, Rob McDowell tried to get the ball moving up field, but the hard-working and persistent Trojans Defence snuffed out any danger possessed by the leagues top scorers. The pressure created by the Trojan’s D was beginning to pay off, as Finnamore was intercepted by both Andrew McGorman and Rick Duffield as Belfast’s defensive-backs shut-down Trinity’s passing game early on. On the other side of the ball, James McKelvey was avoiding pressure of his own from the likes of Dylan Green and Eoghan Hurley on the Trinity D-Line, finding receivers David Richardson and Andrew Wright for some quick-fire receptions. With the conditions worsening, the Trojans resorted to keeping the ball on the ground, with Neil Montgomery and Dave Colvin fighting for hard yards. However, despite plenty of possession the Trojan Offence couldn’t make their efforts count as Trinity’s Defence, containing the likes of Alex Gurnee and Stephen Carton who were terrific all game, held them firm. Midway through the second quarter, the dark clouds that started to fill the skies over Dublin forced the teams into a 30 minute interval, with lightning and torrential rain brining an abrupt halt to proceedings. Although the break was somewhat distracting and interrupted momentum, if gave each side the chance to reflect on the opening exchanges and once they returned to the field, the game exploded into life. With the match still scoreless, both sides gave it their all in an attempt to break the deadlock. The water on the pitch was proving troublesome as it made tackling and gripping even more difficult with the Trojans and TCD struggling to gain consistent first downs. It looked as though this game was going to be won on the defensive side of the ball, and that’s exactly what happened. After finding themselves deep inside their own 20; Finnamore, looking for one of his receivers over the middle was intercepted by Linebacker, Connor Whitla who expertly jumped the route to rush in for a 20-yard touchdown, much to the delight of the Trojan faithful. Rick Duffield converted the PAT that gave Belfast a slender 7-0 lead heading into the final quarter. The last 12 minutes was exciting and intense, with differing emotions on the opposing touchlines. Trinity knew they had to go for it all whilst a few big stops from the Trojans would see them reclaim their crown. As the game entered the final stretch, Duffield sent an excellent punt downfield to pin TCD within their own 20 with little under 2 minutes left. For the students, it was all or nothing. In what proved to be the defining play of the game, the ball was handed off to Rob McDowell who scampered past would-be tacklers down the near sideline. It looked as though this would be the play to bring Trinity back into the game, until a fantastic tackle by Neil Graham forced a fumble, that Andrew McGorman happily pounced on to give possession back to the Trojans and bring them within touching distance of an historic treble. 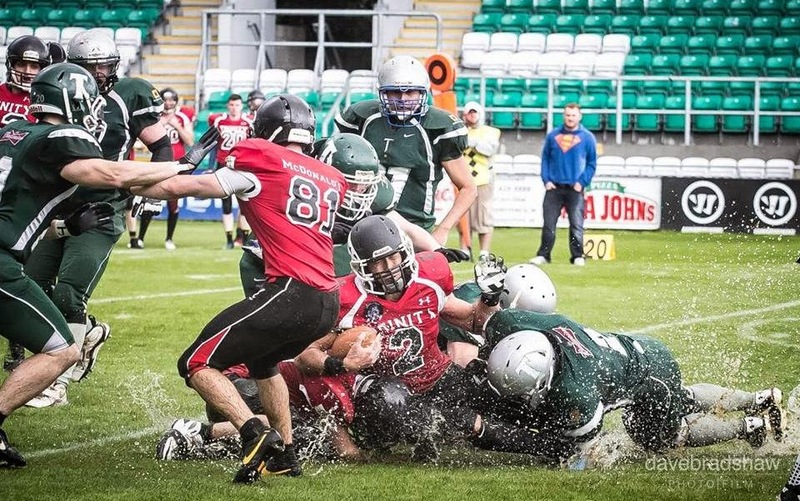 With no timeouts remaining for Trinity, The Belfast Trojans kneeled out the clock to claim a 7-0 victory, earning themselves yet another Shamrock Bowl triumph much to the relief and joy of the travelling supporters. The heroics of Connor Whitla won him the inaugural Terry Lynch Memorial MVP trophy, for his excellent performance throughout the game. The Trojans battled one of the toughest opponents they have ever faced in Trinity College, who did themselves proud with an outstanding effort that on perhaps another day, could well have seen them leave with the trophy. Meanwhile, The Belfast Trojans keep adding to their impressive trophy haul after successfully defending their title as the best team in Ireland. The game was played with fantastic effort from both teams and their performances over the season will provide a great testament for football in Ireland. The Trojans can now celebrate winning their third straight National Championship! The ‘three-peat’ is complete!